wide cut collar suits the lay of his face, i like it. Wow, I need his seven digits cause this guy is fly. I love everything about his look. His hapeup is out of this world. There is nothing like a man with a very nice haircut (clean shape up). An absolutely awesome look. The suit fits, guys, it fits! Child of the 60′s that I am, I never thought I’d find men in suits attractive, but you’re beginning to change my mind. Notice how the three button coat is buttoned only in the middle as it is meant to be. He looks very good. I like how he has really taken time to embellish his mediocre suit with an exceptional shirt, tie pocket square combo (not too sure about the poofy, triangular pocket square). That’s a sharply-cut suit on a very handsome man, but I really like the presentation of his pocket square–it’s the perfect punctuation mark for the look. Can’t make up my mind about the collar, but I think….not. He wears the suit well (everyone can actually put a hand in the jacket pocket without looking sloppy). The contrast collar and spread also suits his head and skin tone. A custom tailor would relish the opportunity to could even those shoulders out and give a little suppression. A clean, classic, understated look. The entire ensemble looks like it’s from Polo- I recognize almost all of the pieces. A saleguy from the Mansion perhaps? I agree that the collar may not be optimal- I’d give him more of a spread, and would also show a little more cuff. Overall, a stylishly calm look. Looks great but why on earth does he pose with a hand down his right suit pocket. Big mistake. It ruins the shape of the suit. A little too boring but I like the colors light blue, with gray and white..nice. Like 3:51 said, “What’s the big deal?”. Nothing exceptional here. The light blue shirt, white collar, nad grey tie kind of blend together in the shot forming a washed out area where the details seem to get lost. sharp, with a capital SHARP! especially the glen plaid necktie. Yeah seriously … what is the big deal? The collar looks like it’s unbuttoned because it doesn’t fit that well. There’s no shirt sleeve showing, which would have sharpened up the look a little. The shirt front is pretty wrinkled. The colour scheme is ok, pretty standard fare. Just what am I looking at!? Maybe it’s out of the frame? Maybe he’s wearing shoes that are so amazing that they can win the war on both drugs AND terror by the weekend! I have to agree with anon 3:51. I’m afraid what makes this ensemble outstanding isn’t that obvious. What jumps out for me is that the jacket is a bit ill-fitting (Or perhaps I’ve been used to seeing slim italian cuts) and the lapel is wrinkled. That said, maybe a little explanation about the choice of shot would help. sometimes menswear is very subtle. It doesn’t have to scream to look good. 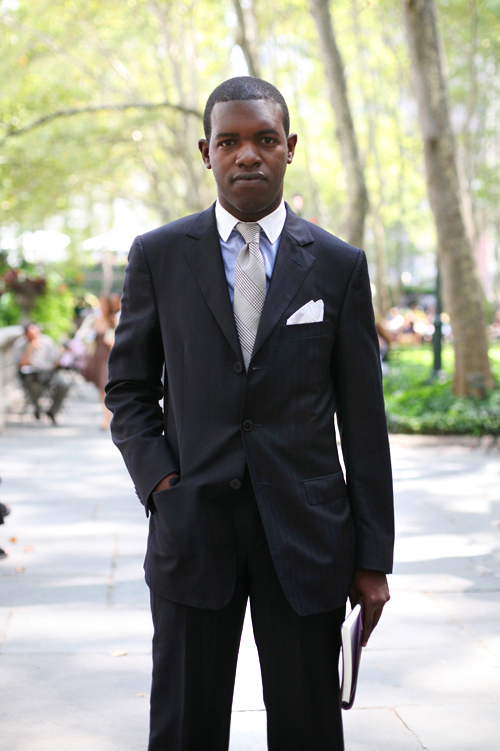 I wish I saw more guys on Wall Street looking like this – and don’t tell me they do. This suit is ok if you are going to church.It doesn´t raise attention at all and you can really be anonymous. I love how slim he and the suit are. Well done style. The guy deserve an A for effort. But the shape of the collar does not suit his head shape. Not crazy about the white collar. The suit is ill fitted. But I agree with Sart, he shows a certain sense of sophistication in his try, sense complitely absent in most Wall Street types. Needless to say I was the best dressed there and the few who noticed, thought it had to do with the way I carry myself and not the attention to the couture I was wearing. Regular readers will be not at all shocked to learn that this lovely gentleman works for Sartorialist regular Robert Burke. 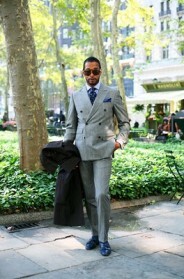 This is what a suit is supposed to do for its wearer: make him or her look respectable, which this suit does to a tee. Bravo! especially the glen plaid tie and the short white collar. he almost looks like an extremely stylish version of someone who would sell you whiskey in chicago in 1922. Awesome! My only bit of advice would be that he complete the look with a herringbone tweed cap. Kwesi is ALWAYS impeccably dressed! Everytime I see him I am charmed by his style and grace. He’s a gem!